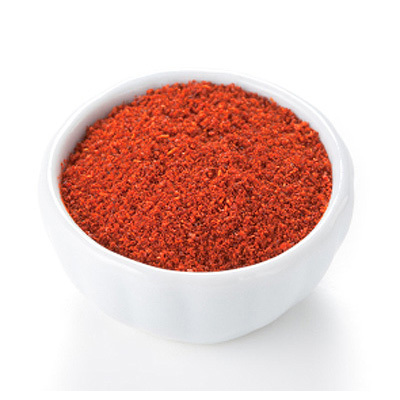 Paprika is made from the ground flesh of the paprika chili pepper. It is used both as a spice and a garnish in a variety of dishes. Its color ranges from burnt orange to deep red. Paprika's taste can vary dramatically from mild to pungent. The standard grocery store variety is generally mild. If you wish for a more powerful taste, specialty and gourmet shops have more variety. There will usually be a taste guide on the label of any prepackaged paprika. Although Spain, Portugal and California produce much commercial paprika, Hungary is most associated with this spice. It is, in fact, their national spice and is a staple in Hungarian cuisine. Goulash, stew and many chicken and fish dishes often include paprika. It is mainly used for it's color, especially in the making of sausage. You can also try it with fish, eggs and salad dressings.